Huey Mills and Kate Mills (formerly Mrs Allan Rae) sitting in the background. Man in the foreground is unknown. Research compiled by Eric Anderson, 2011: This photo, apparently taken by one of the Magee brothers, shows the construction phase of the flume project. The occassion is a visit to the site by Hughie Mills' new bride Catherine, the former Mrs Allen Rae, in the Spring of 1910. In this photo, Hughie Mills appears to be giving his wife a tour of the project. Mills was a building contractor in the valley, and very likely worked on the flume construction. The location is at the west side of the Squamish Timber Company camp, just above the bank of the Brohm River, which is to the left from this scene. It is difficult to tell from the photograph whether the water for the flume is being led from the Brohm River (in the back and to the left of of the photo) or the Cheekye River (around to the right). Either is possible. 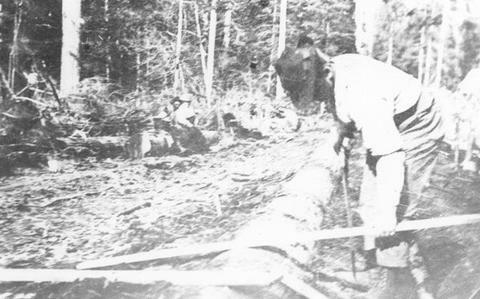 The Squamish Timber Co. camp and the beginning of the flume lies between the Brohm River and the Cheekye River. Water for the flume might be more easily taken from the Brohm( closer), but the Cheekye has the steeper gradient. The larger the logs to be flumed, and the steeper the grade, the more water is required. Andersen, Eric. (2011). Squamish Timber Company's Cheekye log flume, built in 1910. Posters lent to the Squamish Public Library, Squamish, BC.